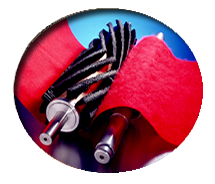 Glass Washing Brushes | Industrial Brush Company, Inc. The Industrial Brush Company offers a complete line of glass washing brushes for a wide range of domestic and foreign glass washing machines. Each brush is designed and manufactured to provide superior washing performance and extended brush life. Each brush core is manufactured using stainless steel components to combat the effects of corrosion. The cores are dynamically balanced at operational speed to ensure vibration-less performance. We also offer a "Light Weight" Brush option for most popular domestic and foreign washers. Contact us for more details. Our "Fineset" Bristle Pattern chemically bonds individual strands of 6:12 Nylon to our metal core. This provides the softest, most uniform contact with your glass. Customers washing Low-E and other Soft Coat glasses have reported increases in productivity and reduced rejects as a result of using our "Fineset" brushes. The full uniform density optimizes performance, extends life, and reduces contamination by eliminating openings that typical coil brushes have. Our "Tufted" bristle pattern chemically bonds groups of 6:12 Nylon in a staggered pattern to our metal core. This provides a stiffer scrubbing action for more aggressive washing applications without loss of uniformity. Our "Tufted" brush yields a long life and consistent quality due to its chemical resistance and even bristle distribution. Our brushes are designed to be stripped and re-bristled to their original "like new" condition whenever they become excessively worn. 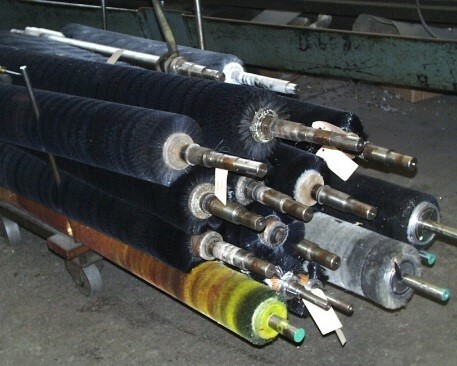 Cores are carefully examined for shaft wear, core straightness, and balance. Repairs are made and new bristles are applied. Re-trim services are also available whenever uneven bristle wear appears. Both of these services are available to customers who have brushes made by Industrial Brush or a competitor. The savings on Re-bristle and Re-trim brushes is substantial. We encourage you to contact us for further information. In many cases, we are already making brushes for your glass washing machine, so it will be helpful to have some type of description handy.